Besides the religious aspects of life in the camp, people needed some form of entertainment and relaxation . There was a large hall with a stage and, of all things, an orchestra pit. The hall had many uses from hosting all sorts of performances like national celebrations e.g. 3rd of May, Soldiers day in August, Independence Day on 11th November, Christmas nativity and other plays. It was also used for meetings and dances. At weekends the hall converted into a cinema showing mostly black and white westerns, war and adventure films, and a lot of cartoons. Woody woodpecker comes to mind. 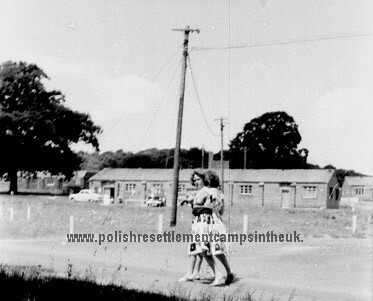 There where two smaller halls in the camp. One had a snooker table and a shop selling sweets, cigarettes and soft drinks we called it “kantyna”. The other was like a large lounge with easy chairs, little round tables and a black and white T.V. This was also the camp’s library, with both Polish and English Books you could take home to read. All these facilities were used as communal meeting and relaxing areas. One must remember that in the early days families had only ONE room to sleep, eat and live in. So these communal areas were vital, after the trauma of war, for maintaining some sort of normality. 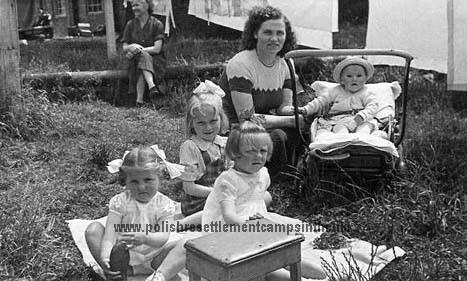 As military camps became home to civilians they were renamed they became known as Hostels but we always referred to then as "Obóz" which translates as "the camp". A view of the camp's shop. For those that could not look after themselves communal meals continued into 1960, many of the residents were now self sufficient but living in the middle of a big country estate with the nearest shops 2 miles away in the village of Blockley and the nearest small town Moreton in Marsh 6 miles away and Evesham even further, shopping for the smallest thing was a problem. To begin with there was an enterprising Polish man with a van, nicknamed "Łysy", (I think his name was Mr. Leon Żbikowski.) He used to trade out of his van outside one of the gates to the camp. Selling rye bread, polish sausage, sauerkraut, pickled gherkins and lots of other goodies. There was someone else with a big van who traded fabrics, bedding and clothing. He came once a week and was allowed to spread out his wares in a hall in the centre of the camp called "ewidencja". Eventually a local shopkeeper from Blockley, Mr. Balhatchet, opened a shop with a sub-post office in the camp. It sold general groceries and fresh meat including live chickens. This made life a lot more easier, as many of the residents were by now reliant on feeding themselves and not in the communal mess. The local bus companies laid on transport once a week on Saturdays to Moreton in Marsh, Evesham and Cheltenham. These weekly shopping trips became very popular and the busses were always full. Some two miles away was Blockley railway station with regular services to Worcester, Malvern and Hereford going west and Oxford and London going east. I remember my parents taking me by train to walk the Malvern Hills and to Oxford to see a Christmas pantomime. From left Maryla Slama. Elwira Slama, (blonde girl cannot place name) Irena Slama in pushchair & mum Władysława aka Wanda Slama. In the background lady sitting on one of the water pipes. Other facilities that the camp enjoyed was a huge coke fired boiler house situated at the far end of gate 3 entrance , this ensured that the brick barracks always had hot water. 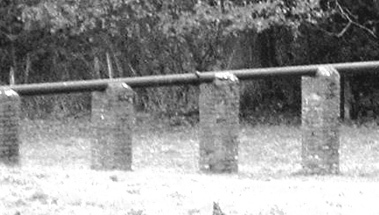 The water was transported in large black asbestos insulated pipes that wound their way around the barracks supported on various sized brick pillars, creating warm places to sit on. Wanda Oko, Basia Woźniakiewicz, and Irena Bachryj. The hot water pipes were nice to sit on. L-R, Rysiek Busz, Michael Robb and Gienek Zdanko. The 52 Nissen huts on the other hand had no internal plumbing, water was fetched from strategically placed cold water taps. 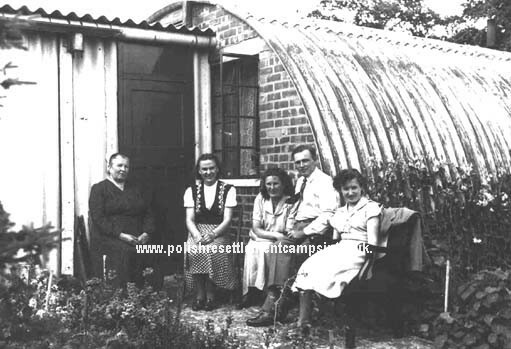 Families living in the asbestos Nissen huts not only had to put up with the funny shaped walls but more importantly their washing and toilet facilities were in a separate building with its own little boiler room in some cases up to 50 meters away. Just imagine having to walk that far, in all kinds of weather just to fill a kettle, not to mention every time nature called. At the far end of a field adjacent to the camp was a sewage farm. 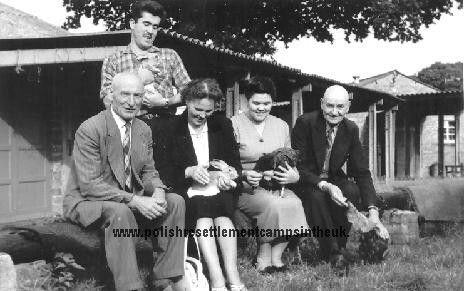 Left;- In their garden outside their Nissen hut are Katarzyna Sklepkowicz, unknown, Zenobia Sklepkowicz, Antonina Olearczuk, Teresa Sklepkowicz. 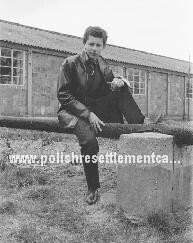 Antoni Olearczuk later married Zenoba in Redditch. 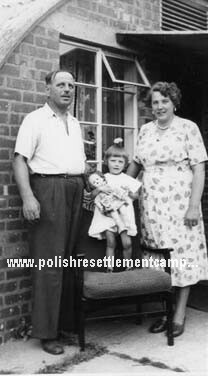 People in the camp came from every corner of Poland and from every walk of life, from farm and factory workers to doctors, nurses and teachers. 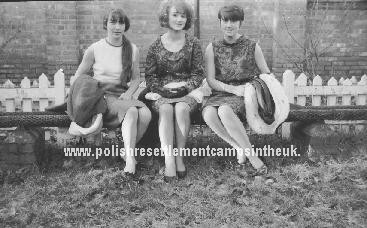 As the camp was once a hospital there was a purpose built sick bay, and it was now staffed by Polish nurses and doctors, becoming very useful for residents with minor ailments. Patients with serious illnesses were sent to a Polish Hospital in North Wales, Hospital no. 3, in Penley. For more information about Penley visit this excellent BBC website. In the early days language problems made finding work difficult. 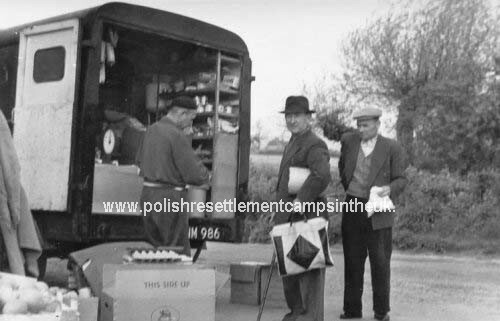 The National Assistance Board employed some people in the camp, in catering, in the sick bay and a few with language skills were employed in administration. Some of the men found work at the Ministry of Defence Royal Engineer’s Depot in Long Marston about 10 miles away. Because of the distance, for many months, before daily buses were provided, the men had to live there coming home only at week ends. My father was one of them and during that time I only saw him once a week. In the mid-fifties life at the camp improved. Most people spoke enough English to get by and there was plenty of work in the area. Most men worked in Long Marston and many others found work at Dowty in Tewksbury and Cheltenham and Esplays in Broadway Women found work in a local canning factory Smedleys in Evesham and Willmotts of Evesham, a case manufacturers. The Needle Industry in Studley and Redditch also gave employment to many more, laying on buses from the camp to the different factories. The hostel’s first warden was English a Mr. J.Q. Evans who was very supportive of the scheme. 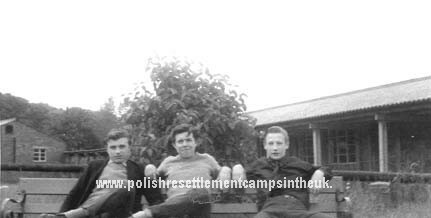 The camp's last warden was Polish, Mr. Juny. When the camp closed down Mr. Juny administrated the last remaining camp Stover Park in Devon. 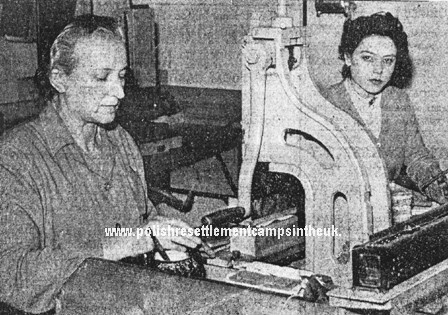 Polish ladies making boxes in the camp's Willmott unit.